Concrete mix design excel sheet calculate mix ratio of concrete component to get the required strength. The sheet calculate the percent of water, cement, fine aggregate ( mainly sand), and coarse aggregate . So by the consequences of the mix design, ratio of these things are obtain to get expected concrete strength. And then present those amount as a ratio. 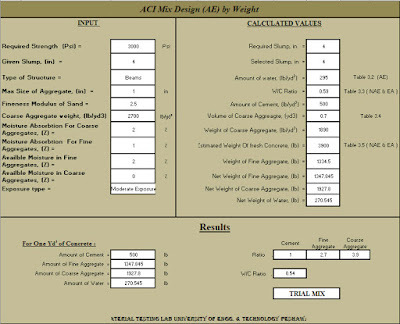 This mix design excel sheet is according to ACI design code.